Giving oral presentations in front of fellow students, faculty, staff, and members of the College’s Board of Trustees is significantly different than in the typical Wabash College classroom. The Seventh Annual Celebration of Student Research, Scholarship, and Creative Work provided an intellectual centerpiece for the weekend’s Inauguration of Dr. Patrick White as the College’s 15th President. For more photos from the Celebration, click here. "Haris Amin was just explaining to me about viscoelastic fluids, and in two hours he’ll be playing guitar in the Jazz Combo," President Patrick White said. "That’s one of the things I love about Wabash. I know so many students here, not because I’m any kind of social genius or have great memory for names, but because these guys are everywhere, doing so many things." Classes are cancelled for the afternoon each year to allow students to see their classmates work. Detchon Hall was packed throughout Friday afternoon as students did poster presentations and talks about research they have conducted in the past year. Andrew McKone has been a part of the Inaugural Weekend on both of the first two days. He played the violin on Thursday night during the Celebration of the Arts and then Friday made an oral presentation on his research: "Shostakovich: Quartet No. 8 in C Minor." "The audience was very receptive and I fed off of that so I guess its similar to performing in that aspect. I felt a little naked without my violin though." Some students face an even bigger challenge when presenting complicated research to people who may know little about their field. Daniel Albrecht ’07 talked to students and several members of the Board of Trustees. His research was titled: Stability of Functionalized Porous Silicon in a Simulated Gastrointestinal Track. "It’s a different process because I have to think how I can help someone understand it who doesn’t or hasn’t had the background of my professors or other students," Albrecht said of the experience. "Every research is specialized so not even every student in my class will understand. If you get someone who can understand a little, it’s a good thing. Sometimes you get, ‘It’s pretty graphics and it looks like you’ve done a lot here.’ "
"I always enjoy myself here," said Syud 'Taz' Ahmed, presenting for the third time at Wabash. "At conferences, you’re always talking to people within your discipline. But here I have to find ways of explaining effectively to people outside my field. It’s great practice." For the first time visitor, the Celebration is even more impressive. "These men dazzle me," new librarian John Lamborn said. "And it’s impressive that the college would devote the entire afternoon to learning about their work. The variety of subjects, the organization of the event itself—all very impressive. 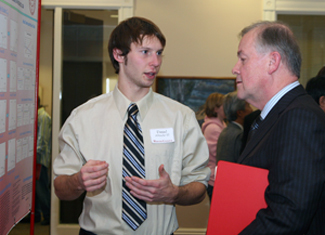 In photos: Top right, Daniel Albrecht talks about his research with the Chairman of the Wabash College Board of Trustees, Joe Barnette.